Clarissa Harlowe by Samuel Richardson 1748. Home » Clarissa Harlowe by Samuel Richardson 1748. Samuel Richardson’s “Clarissa Harlowe.” C. Landseer, Artist. A. Periam, Engraver. Clarissa, or, the History of a Young Lady, is an epistolary novel by the English writer Samuel Richardson, who appeared in 1748. Clarissa is an exceptionally long novel; may well be the longest novel in the English language. The full volume of its third edition, revised by Richardson, reaches over a million words. Only the first edition reaches nearly 969,000 words. The novel is one of the early Romantic masterpieces. One of the early imitators of Richardson contribution to this sensibility is the French Romancière Jeanne-Marie Leprince de Beaumont with her “new Clarissa. A true story” from the year 1767. The book touched not only England, but found throughout Europe an enthusiastic reception. Approximately two centuries later called the German-language literary history “Clarissa” a masterpiece. Radioplay: LibriVox recording of Clarissa Harlowe. Free eBooks: The works of Samuel Richardson 1689-1761 I-IV. 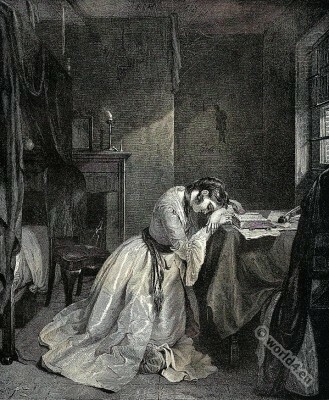 Pamela; or, Virtue rewarded.–V-XII. The history of Clarissa Harlowe. This entry was posted in 18th Century, Baroque, Genre and tagged Artist, Character sketches, Romanticism fashion on 4/23/15 by world4.